5 simple ways moms can squeeze in exercise. Sticking with an exercise routine can be a struggle for anyone. But for moms, squeezing in workouts can feel darn near impossible. After all, how are you supposed to find time to work out when you can’t even go to the bathroom by yourself? These days, I’ve got three kids around, at least one has radar that alerts her the minute my feet hit the floor each morning. I have found that it is really hard to find the time to exercise, even if I wake up early. At least, not without being interrupted by “Can I have a glass of milk?” and “When are you going to make my Nutella sandwich?” or my personal favourite “Do you know where (insert whatever they need right now because they lost it- again! )?” Which of course will be followed by “Mommy!! I spilled my milk…“. Awesome. Bring on the day. I had always thought that for exercise to be effective, it needed to be long, sweaty, and agonizing. So for a season, I would wait until nap time and squeezed in a quick 30 minute video before the kids woke up. Was it getting me in shape? Sure. Was it fun? Not on your life. Now, don’t get me wrong. Exercise makes me feel great and gives me a huge energy boost. It improves my mood and reduces my stress helps clear away the cobwebs. I wanted all of those benefits. But I was having a really hard time consistently fitting exercise in, between being a wife, a mommy, going to school, working full time from home, keeping up with the house, etc. The fact is that anything is better than nothing. If we’re moving and getting active, we can’t go wrong. 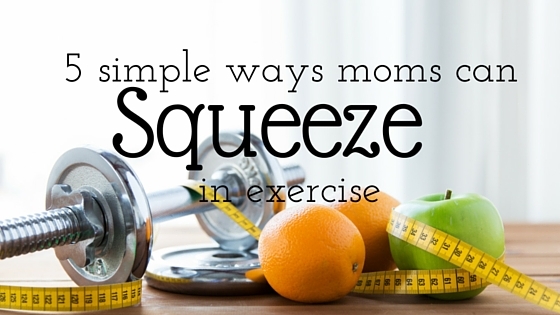 Here are 5 simple ways moms can squeeze in exercise. Play outside: My youngest LOVES playing outside. If it were up to her, we would live outside. In the winter she was dragging her skates over to the ice deck now she’s spending her afternoons blowing bubbles, riding her bike up and down the green belt , and flying kites with her big sister. I find that an easy way to stay fit is to play outside WITH my kids. Involve your children: Run to the mail box, ride your bike with them when they go to the playground. Set up an obstacle course in the living room and race your kids to see who can wiggle their way over and under and around the fastest. Your child will love spending this extra time with mommy. Or better yet check out Pinterest and do one of a gazillion “10 minute workouts” with them. Follow Heather Lawrence’s board Quick & Easy Workouts on Pinterest.Mix cleaning and exercise: I don’t know about you, but I work up a sweat cleaning my house. Between dragging that vacuuming up two flights of stairs or sweeping the entire main floor cleaning is hard work. Why not squeeze in a couple of lunges while vacuuming, push ups while picking up toys and a few squats while cleaning the windows. Park far away: Wherever you go, choose a parking spot that is as far away from the door as possible. Those extra steps add up. Take the stairs: Whenever given a choice, always take the stairs. Climbing stairs is a great way to burn a few extra calories. I want to be there not only for my kids but for my grandchildren as well. I don’t know where or when we decided that working out was “work” and not “fun” like it was back when we were kids. Time to find the fun again! How do you find time to squeeze in some exercise? Based on fitbit challenges with friends, it seems like moms get the MOST exercise! I usually park fairly far away and take the stairs. Great tips for getting in exercise. I am definitely going try a few so I can move more. I used to work out every single day, but have been seriously slacking lately! I love your tips for getting back into it. I used too as well! Then we had about 6 weeks of sickness in the house and everything fell apart. These are great ideas! I have so much trouble sneaking in exercise, especially in the colder months. Now that my kids are playing sports, I walk while they practice. Great ideas! Now that the weather is warming up, I’m excited to play outside with my kids more. Chasing after a 3-year-old and a very active 10-month-old truly is exercise! These are great ways to sneak in a little exercise even for busy moms! Thanks for sharing these ideas! I just got a fit bit so I will see just how active I have been. I am afraid I will be realizng I am to seditary recently. I need help with this. I have gained so much weight after my mom died. I crazy amount. I guess I just need to take baby steps. These are great tips. Parking far away is so easy and yet so often overlooked. It’s hard fitting exercise in with a family. Things I try to do is always park further away, dance with my youngest and get the kids outside. For me, it’s always easier to do exercise in the Spring/Summer because of yard work and gardening. Great tips! Thanks for sharing! The parking spot and stairs tips are two things I regularly do at work to try and get a bit more exercise into my day. The other day I walked from the first floor to the sixth floor via the stairs though and I have to admit I was fairly tuckered out and winded by the time I got where I needed to be. Sometimes just taking the stairs can be more of a workout than you might imagine. I love to mix cleaning and exercise. Sometimes it’s finding ways to incorporate fitness into your everyday tasks that keeps you in shape. I go to the gym and love it, but just started working so I’m trying to figure out how to get my normal gym session in now. Great tips! I’m constantly walking or up on my feet. I finally have my energy back after the first trimester really wore me down. So I’m moving about a lot more! Thanks, I was wondering how mothers (especially some, who look to be in amazing shape somehow) get into shape! This explains theirs systems! My daughter loves trying to do yoga with me. She tried running with me too, but that was a disaster. LOL We’ll stick to yoga! Thanks for these tips, I really do need to find time to squeeze in exercise. I find that’s the issue! simple tricks to add into your every day life, great list, thanks! I park as far as I can safely every time I go out. The rest is great advice I need to work on. These are all great ways to get some exercise into your day as a mom! Perfect ideas, I will try some! I love these ideas! I have been hitting the gym bu trying to find more ways to get in a work out at home and when I am traveling. Great tips. We are moving to our new home which is two stories so I will be getting a workout climbing those steps. All I know is a ranch style house but I welcome the extra calorie burn. I always try to park far away. Not only does it sneak in exercise, but there is less chance of my car being hit by a stray grocery cart or scratched by a door when someone parks too close to me. Love these ideas! When you are a mom you really do have to get creative! I always try to get outside with my son and just run and play with him. It is a lot more exercise than one might think.